Welcome to Cardinal Neurosurgery and Spine! Cardinal Neurosurgery & Spine, Inc., was founded on July 1, 1999 to serve patients of St. Louis and the surrounding Missouri and Illinois regions. Dr. Daniel Kitchens and staff offer a full range of neurosurgical services combined with constant attention to excellence of care. Dr. Daniel L. Kitchens was born in Macon, Georgia and raised in central Texas. He earned his medical degree in 1989 from the University of Texas Medical Branch. Dr. Daniel Kitchens went on to his internship in general surgery at Barnes Hospital/Washington University in St. Louis. 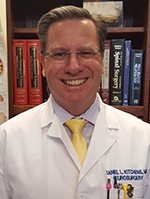 Dr. Kitchens performed his residency in neurosurgery there and completed his term as a chief resident in 1996. He has also served as an emergency room physician in St. Louis and nearby communities.